10 Best Heat Press Machines – What Should You Choose? The importance of investing in the best heat press machines in an effort to ensure quality and longevity in printing cannot be overstated. As an entrepreneur, you will go for effectiveness, ease of use, high-quality work, versatility, and affordability when looking for one. Here, we selected the most durable, versatile, and easy to use heat press machines that pack the best bang for your buck. The F2C 5 in 1 Heat Press Machines are capable of printing your attractive designs on many surfaces. It can print on assorted surfaces such as mugs, coasters, tiles, mouse pads, and t-shirts among others. This 5 in 1 machine can be best described as “entry level”. Even though it can be used for small businesses, it is the best for hobby and home use. Its powerful design, consisting of strong steel frames, is able to resist wear and tear, lasting for a very long time. Additionally, the unit features a full 360-degree swing away design to ensure that you are safe when using it to transfer. 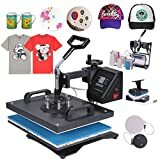 The working area on the F2C 5 in 1 sublimation heat press machine measures 12 by 15 inches, which is just enough to hold more than a few items that you are working on. This heat press is also very convenient. 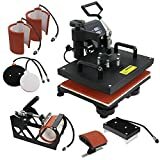 Aside from the 12 by 15 flat plate for doing t-shirts, comes with 5 and 6-inch diameter plate press, eleven-ounce mug press, and 6 by 3 cap press. Like all Chinese made presses, the user manual that comes with it may be difficult to follow. Not to worry though, there are endless tutorials and forums dedicated to solving the issue. The ePhotoInc ZP9BU is best for you if you want to start a business, have plenty of space, and are on a budget. It is very versatile, capable of printing many different surfaces that have numerous printing options that include inkjet, vinyl, and sublimation among others. The heat press machines by ePhotoInc are conveniently sized, measuring 9 by 12 inches. This size is sufficient to meet most printing and portability needs, as you can easily carry it around to wherever you need. 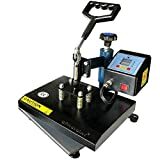 Being a swing away type of heat press, the ePhotoInc ZP9BU ensures that you are completely safe and there is no risk of burning your hands accidentally as you are using it. On the downside, the cord on this unit is a little too short. You do not have the freedom of moving away from an outlet so you basically have to be next to it. Also, as you are setting it up, you need to ensure that you have ample space behind it. If not, you will not be able to swing away from the arm completely out of the way. If space is a constraint for you, you should go for a clamshell style. Unlike the above-discussed options, this T-shirt press starter kit machine is of the clamshell type. This means that it has the capability of working perfectly in limited workspaces. The Promo Heat 15 in. x 15 in. 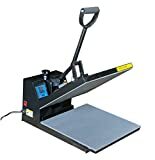 press machine, like most inexpensive heat press models, is a basic entry level machine. It is versatile, capable of printing on a variety of surfaces that include metal, wood, ceramic tiles, and glass. In addition to these, it presses almost all types of heat transfers including vinyl, sublimation, inkjet, and rhinestones. This 15 in. x 15 in., heat press machine has a 15 by 15-inch platen. At this size, the unit is capable of handling large projects such as mats, metal, and garments among others. It also has an elegant design, making it not only simple to use but also visually attractive. An LCD is incorporated into its design to further improve its quality. It displays pressure and timer settings, all of which are digitally controlled. Its 5-foot cord allows you to move away from the power outlet without worry. The machine comes with a 400-watt power rating and features rubber feet to stabilize it and prevent scratching. Although the heat platen is Teflon coated, it is advisable to use a sheet between the ferment and the platen. 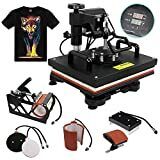 If you are looking for an inexpensive home or professional T-shirt heat press kit that has high production standards, then this may be the choice for you. It is made of very strong and durable materials, which not only make it a good investment but also give it an edge over its competitors. You can use it to customize t-shirts, ceramic plates and tiles, mugs, mouse pads, coasters, and caps among other items. What Is Special about the Painting by Numbers? This six in one unit features the swing away design so it may not be ideal for constricted spaces. Its reputation can be attributed to its interchangeable system of heat platens. Since it is CE certified, you are assured of a top-notch quality service for a long time. Almost everything is right with this heat press. However, just like its 5 in 1 counterpart from the same company, there is a problem with the manual. In the words of one Amazon customer reviewer, the instructions “… rival a book written by a toddler in a foreign language then poorly translated into English…” Nonetheless, general internet searching will get you all you are looking for. The Fancierstudio DG heat press machine serves as an improvement to the preceding models. Unlike them, this has a non-stick sheet and a no-stick coating on the heat platen. It is compact and opens upward, making it great if you are looking to save on space. Its 15 by 15-inch platen is ideal for large items so you don’t have to iron your XXL shirt in stages. A Teflon sheet is featured to prevent sticking. With this unit, you are assured of safety because unlike swing away and other clamshell models, the draw on this one pulls out towards the user. On top of that, it has an automatically releasing magnet, ensuring that your hands are at a safe distance from any harm. The DG Heat press machine has an easy to use a clamshell design that allows for sturdy and durable operation. When pressed down, it offers industrial strength, temperature, and pressure, guaranteeing that the transfer done on the garment will last a while. The company does not offer an extended warranty on the product, and you need to pull on the handle with some strength when opening it. Otherwise, it is a good product, perfect for beginners. The moment you lay eyes on the Fancierstudio Heat Press machine, you will notice how well built and elegant looking it is. It is sturdy, and holding it gives you the assurance of a lifetime of service. The pressure knob is conveniently placed behind the handle for ease of operation. It is made of the very durable rhinestone. For you to use this Fancierstudio Heat Press kit, you will need to flick the bright red light, and it jumps to life. The 0 – 500 degrees temperature can be monitored on the display. Its non-stick surface is coated with Teflon, keeping your garments from getting scorched. With adjustable pressure, the unit can be used to press materials of varying thickness and still get consistent results. Although lightweight compared to other similar t-shirt printing equipment, the Fancierstudio heat press machine can handle everything you throw its way. It is well capable of handling heavy, as well as light tasks, making it ideal not just for home, but for commercial use. The only hitch with this model is that it, although great value for its money, does not offer the functionality that comes with more expensive models. Like all other Mophorn products, this 8 in 1 T-shirt press starter kits machine comes fully preassembled, so you need only to get it out of the box to start using. It is virtually scratch resistant and with its robust, fully-welded steel construction, durability is something you don’t have to worry about. The fact that this is an 8 in 1 unit tells you all you need to know about its versatility. 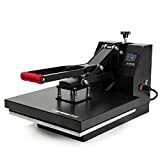 It means that the Mophorn heat press comes with a plethora of attachments that allow you to print on all surfaces, even those that standard heat press kits can’t. These attachments include a hat press, two plate presses, and four mug presses. It has a large heating platen, measuring 15 by 15 inches, more than capable of meeting all printing needs. The unit also features intelligent temperature and time control. This allows you to set the right time and temperature, respective to the type of material, resulting in the best quality transfer. If versatility is what you look for in a heat press machine, then you might have found the Promo Heat PRO-3804X a home. At double the price, it would still be of immense value, but at its current one, it cannot be beaten. It comes with the sufficiently large 15 by a 15-inch surface, which allows you to print on a variety of surfaces and sizes. The reason as to why the PRO-3804X is so popular with beginners is its ease of use. It comes preassembled and ready to use so you won’t really need to pick through the scanty manual. As it incorporates the clamshell design, it will save you as much space as possible. Once you have had it running, the LCD timer lets you set the desired time. You will be alerted once the time is up by an audible alarm so your items will never be overexposed to heat. Unlike most models with a similar price range, the PRO-3804X features a Teflon coating to prevent sticking, further enhancing its convenience. It allows you to adjust the temperature depending on the material you are pressing, and an arm handle with an ergonomic grip, so you can use it for long durations comfortably. The product, although great in every other way, does not come with an applicable warranty. The Fancierstudio BB1515 Power Heat press machine comes as an improvement to its preceding version. It is of the clamshell design, which makes it great for saving space and with its compact design, it is portable and can be carried around with ease. Coming from a reputable company, this machine has all that you need to get quality prints. It features an electronic temperature and time control system. This not only enables you to set the exact transfer time but also results in a painless transfer performance. A silicone gel base board is fixed at the base of the machine. It improves not just the overall stability, but also gives you an easy time when operating it. The 15 by 15-inch platen on the Fancierstudio BB1515 gives you more than sufficient space to work on different sized items. This heat press ensures that you don’t get undesired results by burning your clothes and other things. You can easily adjust the pressure as you transfer your designs to different materials. In addition, the Fancierstudio BB1515 has an integrated stopwatch that beeps loudly when the set time is over, reducing the risk of overexposure. On the downside, this unit has row edges on the bottom so you will need to place it on a table that cannot chip easily. PowerPress is one of the biggest names in the heat press machines industry so it is not a surprise that one of their products made it to the top of the list. Since the PowerPress Digital Sublimation Heat Machine is an improvement over a previous version, it comes with a lot of enhancements to perfect your printing experience and quality. The most notable improvement on the unit is its 15 by 15 inch Teflon coated aluminum platen. The aluminum is responsible for even temperature dissipation across the large plate. The Teflon ensures that the fabric does not stick to the surface, aside from giving the machine an elegant look. This industrial-grade material is extremely easy to use, featuring an LCD control board that you use to interact with it. You can control the amount of time, temperature, and pressure to get the desired outcome. When the time set is over, you will be alerted by a sound beep. Using this unit steers you clear off any risk through the featured dual electronic system protection. Its integrated electric controls simplify adjusting and maintaining it. When picking any heat press machines, the most important consideration is your objective and the tool you will use to use to achieve it. Well, the heat presses are an affordable way to create your own designs and customized items. 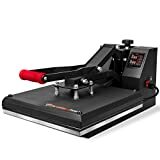 Whether you are looking for the ideal heat press to open up a store or to work from home, there is something for you in the options above.